May 28th was opening day of the Greater Winnipeg Senior Men's Baseball League. The Winnipeg Free Press published a photo of the starting batteries of the 5-2 win for C.U.A.C. over St. Boniface. 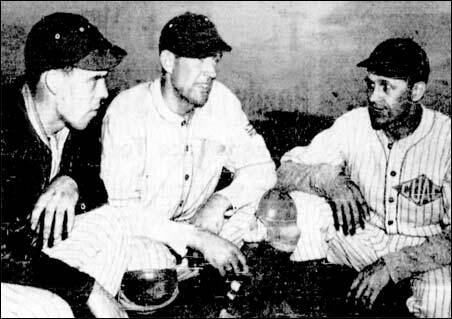 Left to right - Gus and George Merlevede for St. Boniface, Bill McDonald and Ian Douglas for the Blues. The Winnipeg Tribune had a photo of three members of the CUAC Blues. 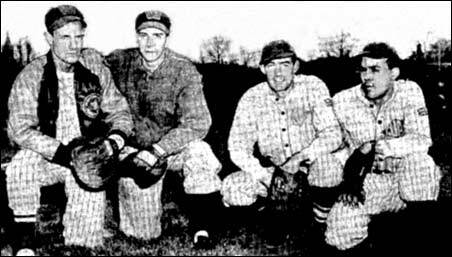 Left - pitcher Douglas (they had his first name as Jack), catcher Butch (rather than Bill) McDonaald and playing manager Stan Shaley.